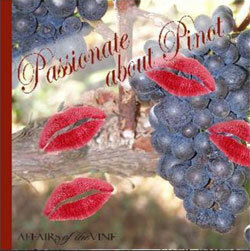 Why are you so in to pinot! I mean it’s like a thing for you. Yes, that is a line from the movie Sideways, in which Pinot Noir played a central character, and yet, it is so true in my world. For me, Pinot Noir has a certain j’ai n’est c’est quoi, that certain something that you cannot put a name on. It has an allure, a mystery, that cannot quite be explained with worlds. Pinot is so diverse. Yes, you can probably say that about many varietal(as my friend Randy pointed out recently) but Pinot in particular has such a wide variety of styles, even within a small growing area. There are hundreds of micro climates that influence pinot, just as the fog influences the weather. Pinot Noir is grown around the world, and varies greatly. And yet, it’s made from the same grape. Are these wines different? Are they the same? Is there a commonality you can find? All of these things inspire me to seek out new pinot noirs. This Passion for Pinot, leads me to return to my favorite stomping grounds in the Russian River time and time again. It also leads me to spend a LOT of money on Pinot noir, and to attend every Pinot tasting I can including Pinot Days, the huge tasting at Ft. Mason, and the Pinot Noir Summit. This year, I was delighted to be invited to be a judge for the Pinot Noir Shootout, which is where we, the panelists, tasted literally hundreds of entrant wines for final voting and inclusion in the Finals at the Summit. BOY oh boy were there some interesting wines during the judging! There were good, there were bad, and there were down right scary. OF course, there was also the sublime and the occasionally off wine, which is to be expected in any large tasting. The time has come to put our judges hats (and taste buds) to the test at the 8th Annual Pinot Noir Summit, presented by Affairs of the Vine, on February 27, 2010.. As a wine consumer, you can bring your taste buds along to taste what we taste and make your own decisions on the winners and losers. This is a rare opportunity for you to taste the top wines blind, and vote for your favorite. An added feature is that we tally the votes by male / female, in an effort to see if gender effects taste. When Pinot Sparkles! Sparkling wine is traditionally made from Chardonnay, Pinot Noir, and / or Petite Munier. Taste some examples of Blanc de Noir, the sparking Pinot noir, and find out how these wines are made. Food & Wine Pairings – What should you pair with your Pinot? With such a wide variety of styles out there, one Pinot is not equal to another. Taste for yourself! Winemaking 101 – Pinot Noir is called the heartbreak grape, and for good reason. Find out what the unique challenges of pinto producers are, and what decisions are made when making a world class wine. Discovering New Stars – What’s hot in Pinot Noir these days? Ever since Sideways launched Pinot in to the stratosphere, there have been rockstars emerging. Taste some of the latest and learn what sparked their interest. It’s a Small World – A Global perspective on Pinot Noir – Pinot is produced around the world. what makes and Oregon Pinot different from a Santa Maria Valley Pinot? What about Chile? burgundy? It’s all the same grape, so why are the wines so different? Sustainable? Organic? Bio Dynamic? What is all this…manure and what impact does it have on the wine? The subject has been a hot debate in the industry, and you can hear frm the farmers as they share the wine they produce. Once you taste the wines blind, and participate in some of these fantastic discussions, you will be invited to a Pinot Noir reception, where the bottles are revealed, and you can see what you voted for. This is one of my favorite parts of the summit, because there are often surprises thre. Will you love that $100 wine? Or will you love the budget bottle? Find out! Finally, the awards will be announced, and the Shootout Winners will be announced. Go Pinot! The full day of events is $125, and worth twice that amount. But, if you’re in a hurry or on a budget, you can opt to attend the evening reception only for $75. I hope you can join us, and see our winning wines! It should be a fantastic day. This will be my third Pinot Summit, and they keep getting better!